Chacoda, here, is giving us the chance to see what the harbor seals see during a training session. Not only can we see the tunnels and toys underwater in the exhibit, but you can also see yourselves—the visitors—through the glass! Lead marine mammal trainer Paul Bradley has been working with Chacoda, or Chuck, for many years. The pair have a strong connection, and Paul has taught him some impressive behaviors. You may recall that Paul trained Chuck to wear a simple harness across his back and over his flippers several years ago. 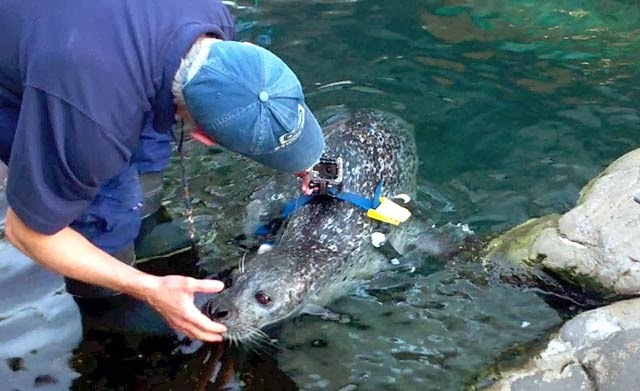 That harness was fitted with a camera back in 2008 and our very own "crittercam" was born. Fast-forward to 2014 and the advancements in underwater camera technology have come a long way. The harness is fitted with a tiny GoPro camera today, which returns crisp video and exciting perspectives of the exhibit. And if you liked this video, wait until you see the one we have up our sleeves. Chacoda was wearing the harness when he was showing his ability to leap out of the water and spin! Stay tuned for that one. Look who visited the harbor seals after the Red Sox won the World Series! Come by the Aquarium this weekend and see if the seals want to interact through the glass. Want to get even closer to a seal? Like, in the exhibit next to a seal? 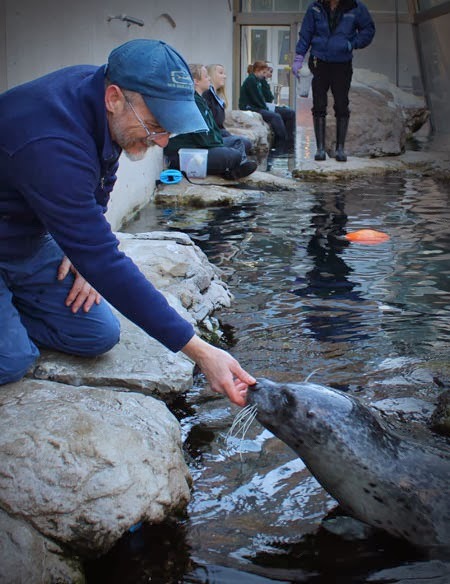 Consider our Meet and Greet a Seal programs with the fur and harbor seals! Get a front-row seat as a trainer teaches new skills, feel the seal's belly fur, maybe even get a kiss.